Is your young athlete SMART? Soccer season is here! All across the front range, youth soccer teams are back at it. Practices are in full swing and games have begun! 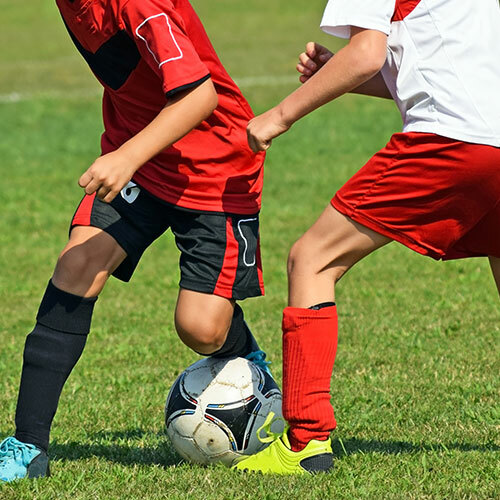 No matter what level of play your young athlete enjoys, sports injuries are unfortunately part of the game, and knee and leg injuries are the most common. Causes range from overuse of muscles and tendons, or from trauma – a kick to the leg or a twist of the knee. We can’t always avoid injury, but parents should be aware of the most common injuries, and know what you can do to keep your young athlete active on the field. Trauma injuries – from collisions and impact – can vary from slight to severe; from bumps to broken bones. The severity of many are often quite clear but internal trauma and tears may not be as easily recognizable. Know your child’s performance and pain tolerance and pay close attention when something appears to alter either. Strains and pains are frequent indicators of overuse. 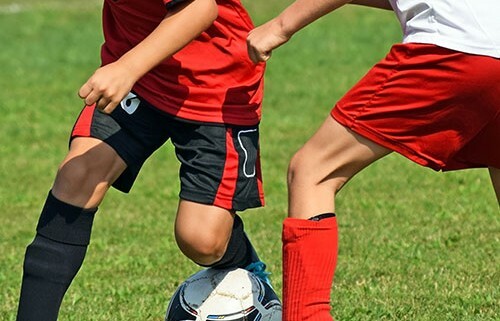 Each season countless soccer players of all abilities encounter calf strains, shin splints, tendinitis, groin pulls, or even stress fractures – classic overuse injuries. Parents and coaches can fail to recognize the severity of an overuse injury. A watchful eye and candid feedback from the player are very important. S – See a doctor. Start the season with a physical to assess overall health and identify any potential problems. M – Maintain proper conditioning to defend against wear and tear on your body. Even energetic young athletes can’t go from a lazy offseason to a full practice and competition schedule without risk of injury. Maintaining healthy playing status is directly tied to stamina and performance and serves as a great tool to combat injury. A – Adjust your diet (food and water intake) to match season’s strains. Training camps and games are good examples of the sport’s extra rigors and both require adequate fuel and hydration for performance and recovery. R – Recognize weather conditions and the impact it will have on your body. Excessive heat, high winds and extreme cold all impact muscle and bone’s ability to respond to movement and exertion. Recognize the role that the elements play in sports, and plan ahead with proper protection to minimize their negative effect. T – Time off. Protect your body from the injuries and fatigue of over-use. Playing an alternate sport periodically or skipping a session rather than year-round play can give your body and mind much-needed relief and allow young athletes to stay sharp physically and mentally. All sports carry risks and rewards. As parents, coaches and doctors, our goal is to support and educate athletes to minimize risks and allow them to #BeActive and enjoy the rewards of athletics and teamwork. https://advancedortho.org/wp-content/uploads/2016/03/soccer2.jpg 500 500 H. Andrew Motz, MD /wp-content/uploads/2017/09/AO_logo_shadow_occ.png H. Andrew Motz, MD2016-03-23 10:35:202016-04-20 10:59:42Is your young athlete SMART?